3/22/18 Article in Daily Breeze on "Judge orders mediation in contested PV Homes Association board election" -- click here. 3/2/18 Article in EasyReader News on "Judge orders count of disputed votes in Homes Association suit" -- click here. 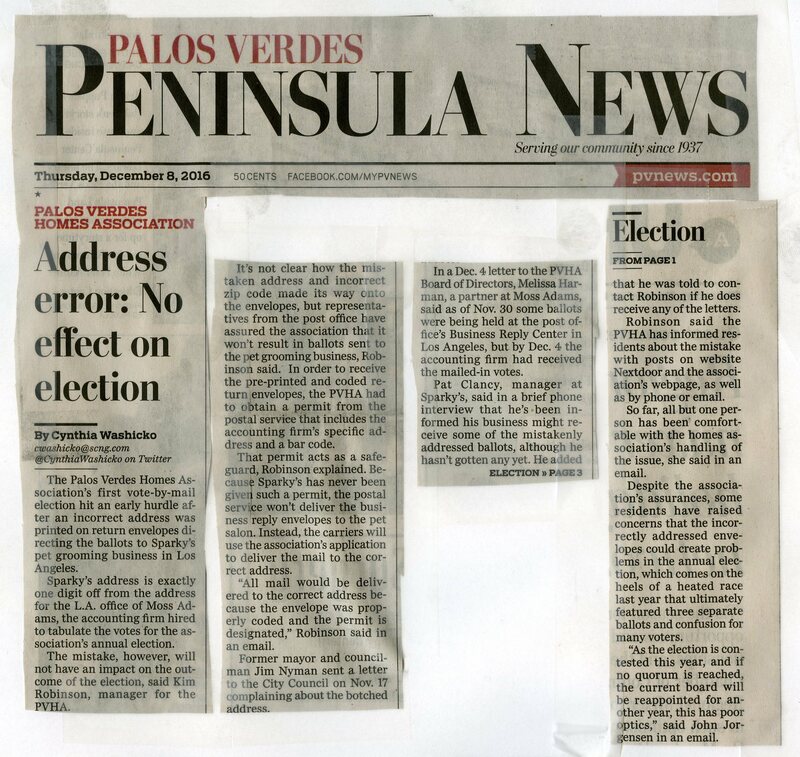 12/8/16 Article in Peninsula News on "Address Error: No effect on Election". This article incorrectly leaves the impression the address error is a non-issue by quoting Kim Robinson (manager for PVHA) as saying that "so far all but one person has been comfortable with the Homes Association's handling of the issue." This statement is far from the truth. Dozens of residents have contacted the PVHA, written emails to PVHA, or posted comments expressing concern on NextDoor (click here for a sample). For the article, click here. 12/31/15 Article in Daily Breeze on "Mark Paullin steps down as president of the Palos Verdes Homes Association" -- click here. Similar article in Peninsula News, click here. 7/9/15 Article in Peninsula News on "Judge Rules Land Swap Deal Illegal". For this front page article, click here. 7/2/15 Article in Daily Breeze on "Judge Rules Palos Verdes Estates Land Swap With Wealthy Homeowner Was Illegal", click here. For comments from the public on this article, click here and scroll to the bottom of the web page and click the box "view comments". 7/1/15 CEPC Press Release on Judge's Ruling, click here.